I've had terrible open pores on my nose and they were getting worse every year. There were days where they couldn't be covered even with BB cream. However, since I started using this cleansing oil, they started becomes visibly a lot smaller, and are now cover-able with BB cream. Although the blackhead are still there, I can hide it with makeup so I'm pretty satisfied. At first I went to Shu Uemura to buy a foundation, but I ended up buying this cleansing bottle they used for me, and now I'm on my third bottle already. First of all, my blackheads are all gone! Although I haven't used pore clearing packs for more than a year, my family tell me that my pores look clean and beautiful. My skin looks one tone lighter too, and I feel that my lotion is working better on me. Since it doesn't require any double cleansing, it's also very convenient. I know I have to cleanse using lather, but I always end up rubbing my skin. It is expensive... but I can't quit using it after knowing it. It's so true that the cleanser is more important than the serum. 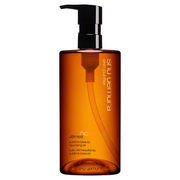 I've used other Shu Uemura's cleansers but this is my favorite and I'm on my third bottle. Firstly, the scent is my most favorite out of any other series. I also really like how my skin feels after cleansing, and it's gentle to the skin because there's no need to use any other face wash. It's pricey... but it's worth it! I change up my cleanser everyday but when I just want to take my makeup off quickly, this is my go-to. It's so nice to be able to remove makeup off so quickly with oil, and I'll definitely keep on using this. The reviews were so good, I bought the smaller size! I was worried about my pores & acne, so I was thinking maybe the pink or puple? but the store lady recommended this to me. Apparently my skin was also extremely dry, but I hated it when my skin felt sticky, so I always used both a cleanser and face wash. This time, I trusted the lady and just used this product. As a result, my skin hasn't felt this smooth for a while! It's not sticky at all! I could tell my skin was softer and more moisturized. During cleansing, the blackheads? come out and feels really satisfying. Removes makeup perfectly too ◎ And above all, my acne got so much better and I'm happy. It is a little pricey, but if it's this effective, I think it's definitely worth it.